Contact Ed- +1 954-646-1609 or email Ed for more information about past or upcoming events. And please visit and like our Facebook page- keep in touch with the whole Hampton family here: Hampton Yacht Group Facebook page. Hampton Yachts is proud to announce the new Hampton 650 Pilothouse, designed and built for safe, comfortable and dependable cruising. The attention to detail in every facet of construction is what every discerning yacht owner would expect in a semi-custom yacht. It continues to reflect Hampton Yachts' uncompromising commitment to superior yacht design and construction. The ultimate expression of performance and style wrapped in a European aesthetic. Designed by J.C. Espinosa, the Hampton 830 Motor Yacht is the embodiment of luxury cruising with accommodations you'd expect to find in a 5-star resort. The Hampton 830 adds an additional level for entertainment, unwinding in the sun, and enjoying spacious interiors. She is sure to meet all of your lifestyle needs. Historically and certainly during the 37 years that I've been a yacht broker, certain trends have become obvious. I offer these observations to you so that you may benefit and, without having to spend 37 years gaining the insights forged from time and experience. #1. The best month to list a yacht for sale in any given year is December. December, January and February are the months of slowest demand and beginning in March and peaking in June but continuing strong through September, demand for yachts is consistently good and strong. So, if one wants to maximize one's return on their investment in yachting then, list the yacht for sale in time so that the marketing effort may be professionally prepared and placed so as to coincide with the months of increasing and peak demand. #2. No yacht or boat goes up in value as it gets older. To be in denial as to the actual fair market value will inevitably cost the owner money as the vessel depreciates annually and carrying costs persist. Regarding the establishment of "fair market value," the asking prices of comparable boats on the market aren't indicative of "fair market value". Remember, these are just the boats that haven't been sold. Use the data available of Comps sold to determine "fair market value" as to do otherwise will cause delays and cost one $. #3. Every decade has a boom time for yacht sales and a bust time. In the years around the middle of every decade since I became a broker of yachts, we've seen strong demand. In 1985 and the 2 years on either side, the economy was booming, yachts were selling strongly and prices were supported. Same thing again in 1995, 2005 and 2015 and at the end on every decade, yacht sales go into the dumpster. If you remember 1979, 1989, 1999, 2008, tell me that I am wrong. Not that I recommend that anyone buy a yacht to profit monetarily, yachts are much more valuable than that as an investment in living one's life well but, having said that, if, you're going to buy or sell, take note of the above. The yacht market is cyclical and, predictable. We had an unusual experience today. We were heading back to Miami from Bimini, but because the ocean was flat, decided to fish for a few hours first. We anchored in 40 feet of water for yellowtail. Eventually they came up, and we were catching a few. Ruth and I each had a yellowtail on. Out of nowhere, a big dolphin started chasing the tails. 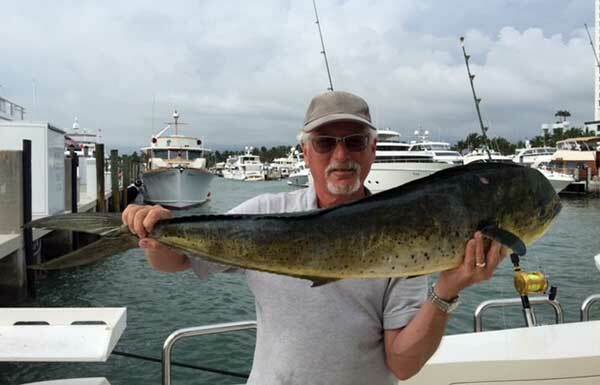 I managed to get mine into the boat, but Ruth decided she wanted to catch the dolphin. She left hers in the water, and sure enough the dolphin hit it with a big splash, and was hooked. We were using light tackle with 15 lb test, so it was quite a fight. Lots of great jumps. It took about 15 minutes to get it to the boat and the gaff. Amazingly, with just the two of us we managed to gaff and boat it. The story gets better. When we got back to Miami this afternoon, and I cleaned the fish, it turned out our entire yellowtail was in the dolphin's stomach in one piece. It's hard to figure how it got down its throat whole. The dolphin weighed 15 lbs. Remember that this was in 40 feet of water. Marc and Ruth C, a smart young couple from Florida, knew what they were looking for when I met them during the Yachts Miami Beach boat show. They were experienced boaters and cruisers and passionate about living aboard and fishing and had just completed a cruise from the Bahamas, northward, up the U.S. East Coast, through the Chesapeake Bay and back aboard their 50' Post, fly-bridge convertible sport-fisherman "Ruthless II". They were at the boat show looking for more interior space as well as more storage capability but, were NOT going to have a yacht without a cockpit. 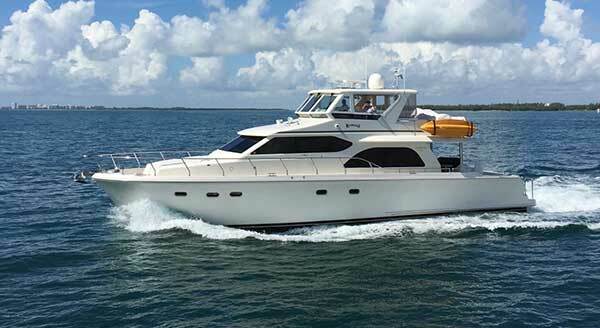 The Hampton 64' Yacht-Fisherman combines the "best of all worlds" in a solidly constructed "couple's cruiser". A Hampton 58' pilothouse motor yacht model with 3 double staterooms and 2 heads but, with a 6' cockpit built into the yacht design while under construction ensured that the rudders were installed where they belong, "all the way aft". Besides providing exceptional handling in following seas and potential for fishing and diving, this design enabled for the installation of a second generator and additional fuel tankage for longer range cruising. Looking for more comfort and range, Marc and Ruth found the stabilizers, bow and stern thrusters, walk-in engine room with standing headroom, walk-around side-decks, galley-up and air-conditioned fly-bridge aboard the Hampton to be attractive features of the "one next right yacht" for them. 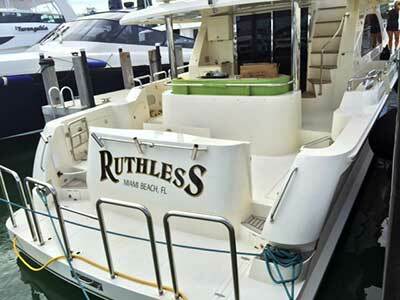 Look for Marc & Ruth aboard the 64' Hampton Yacht, "Ruthless", starting northward in May on their cruise to New England this coming summer (2016). If you aren't able to make out the name of the yacht-fisherman from a distance you'll be able to recognize "Ruthless" as the cockpit motor yacht with outriggers, 2 kayaks and the nice, cool and laidback owners. Being good at this job of yacht sales is the proverbial "double edged sword". If done well, your clients are satisfied for a long time with the yacht that you assisted them in buying and, don't buy and sell every 2-3 years or in Marc & Ruth's case, even every 5-10 but, oh well, that's the price you pay and the reward you earn for doing the job well. Looking forward to assisting you professionally to get out there and "doing it", I remain. Should you be interested in buying or in building a new motor yacht between 60' and 100' then, I invite you to call me for an appointment to sit down, discuss your needs and goals and meet with Hampton's architects and owner/builder. Looking forward to assisting you to own the "yacht of your dreams", I remain. Read about my adventures visiting the Hampton/Endurance Yachts Shipyard this past summer for the 2016 model Endurance 686 Sky-lounge LRC by Hampton Yachts during final inspections at the shipyard in Shanghai, China during July. This yacht is now here in Fort Lauderdale and being commissioned for sale and display during the Fort Lauderdale Boat Show in November. The Yachts Miami Beach and the Palm Beach Boat Shows - 2016 were well attended and the people we met during these shows seemed serious about buying and owning boats and yachts and, about boating in general. A word on current market conditions and the availability of yachts for sale. 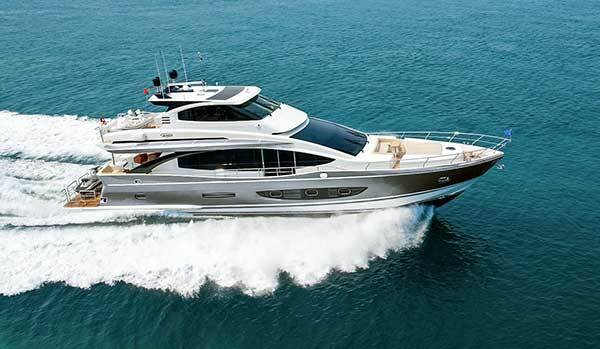 Demand for boats and yachts is and has been strong for the past 3-4 years. 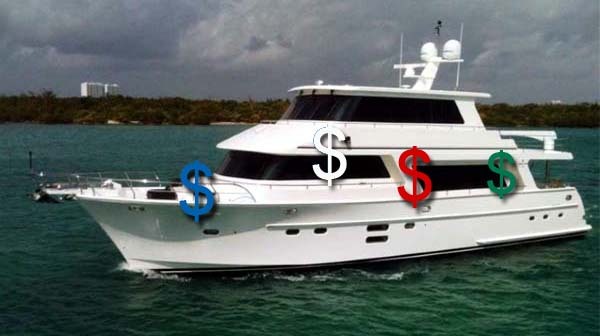 The low prices for diesel fuel, low interest rates (4%), elevated value of the stock markets and, coupled with the arrival of spring-time and re-berth that it brings to the boating and cruising season, has the table set well for strong demand for yachts for sale. Should you currently own the "yacht of your dreams" and one which is going to work out perfectly for you and your families boating and cruising needs for the next 4-5 years then, by all means keep, use and enjoy the yacht that you own now. But, if the yacht which you own now isn't the one which you want to have and to hold for the next 4-5 years then, sell it now. The market for yacht sales is strong, right now! The best way to maximize one's return on their yachting investment is, to sell it sooner, rather than later. No boat goes up in value as it gets older! If the yacht which you own currently isn't the one that you want to own 4 years from now then, sell it now, while the demand is at its peak. Market values for yachts are good, strong and are holding steady for now. Searching and finding a great "next yacht" for one's needs and budget isn't easy nor simple currently and a good broker can save a buyer a lot of time, trouble and $. In 2006, no one saw 2008, 2009, or 2010 coming. If your current yacht isn't the right one for your family's needs long-term then, sell it now and get the one that you want to own; it'll never be worth more than it is right now while the economy is positive and the consumer's optimistic. 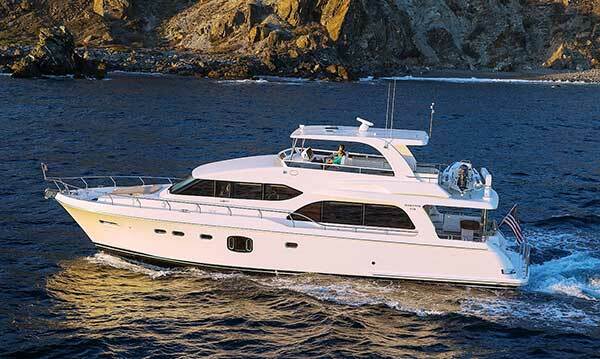 Good deals on new Endurance and Hampton Yacht models exist right now in the 65' – 83' range. Should a 3-4 stateroom long-range cruiser (LRC) or a pilothouse motor yacht be "the next best yacht" and one that you would want to keep for the next 5 years, then look to invest in a high quality Hampton or Endurance Yacht by Hampton Yacht's Shipyard. Models are in-stock and available for inspection and immediate delivery.